Group 2 (Yellow) Parachute Assembly, Quick Attachable Chest, Type A-3 harness. White webbing with a central black fleck. It has the early cadmium plated 'dog-lead' type fasteners and snap hooks to hold a matching pack. 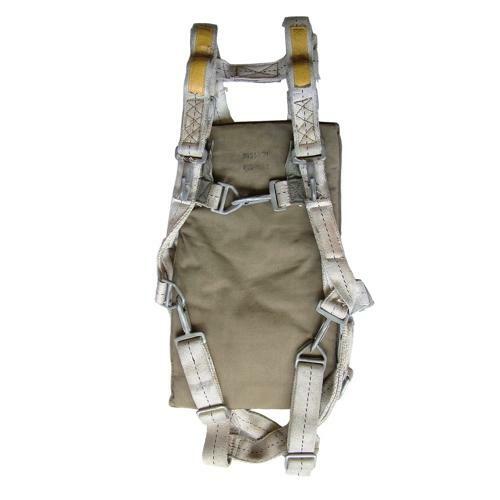 The riser straps are clearly marked with yellow patches to ensure the wearer has selected the correct pack. Fitted with the correct horsehair filled olive drab canvas backpad dated August 1943. The harness appears to be unmarked. It has some soiling and wear but is generally in very good '+' used condition. As with all parachute equipment, now getting very hard to locate. We can also supply a suitable pack should you need it. Stock code S22944.